Insert a toothpick into each banana piece. In a medium microwave-safe bowl, heat chocolate chips in 10-second increments, stirring between each, until melted and smooth. 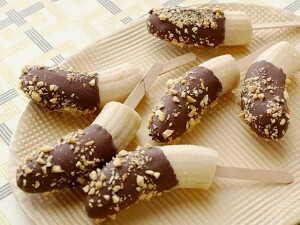 Dip each banana piece in chocolate, shake off excess, and cover with sprinkles. Chocolate should set quickly, but if necessary, freeze pops to harden coating before serving.